Summertime is here; is your yard ready for company? Of course you have the regular maintenance to do, but what about an outdoor room? Do you have a space outside to entertain your family and friends? It is like expanding the square footage of your home, when you have an outdoor room. It brings unity to the family, and a fantastic space to spend with them. Hanging around a fire pit roasting marsh mellows and hotdogs is a time honored tradition. Children and adults alike love this classic family entertainment. Why not install a stone flooring with a fire pit? You could have benches created for permanent seating too. Imagine the fun this space would bring to your home and in your life. Are you needing some privacy from your neighbors? Install a privacy fence around your pool area, so you can swim without being in view of the entire neighborhood. This will also add safety which will lower your insurance costs. Is your yard boring? Does it lack interest? How about adding dimension to the landscape? Your yard could go from plain to eye catching. Add in raised flower beds, a water fountain, shrubs, and a pathway. This will give your outdoor space movement. You and your guests will want to wander about the yard to enjoy it. You can add an irrigation system to water your yard more easily. You could also correct landscape issues that cause ponding during rain storms. Adding irrigation will help the flow of water throughout your outdoor space. It will protect it from erosion too. Why have just a grill, when you can have an outdoor kitchen? If you are planning on having friends and family over for meals this summer, install an outdoor kitchen. You will not longer have to haul a table, chairs, and all the supplies outside. It will all be set up ready to use. 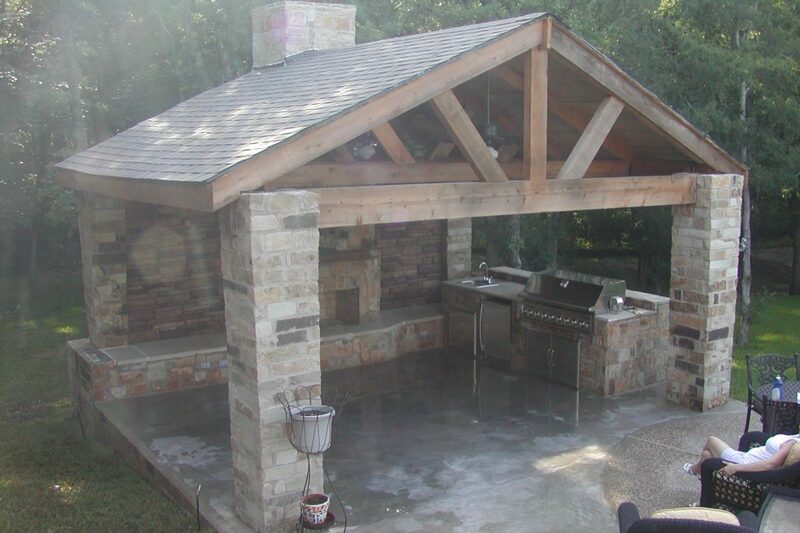 A beautiful and functional outdoor kitchen can be designed to fit your personal needs. Define your outdoor space with an overhead structure. It will provide shading from the hot sun. This will make your outdoor space useful even during rain storms. Picture your family gathered together in your new room. You could sing and jam there, or play board games. It would be a great space for birthday parties too. It is time to take advantage of your yard and turn it into useable space, while increasing your property value. Your family and friends will be thrilled with the ambiance you create for future gatherings. Your home will become the hub for all occasions. This decision to create an outdoor space is an investment in your family. Creating Exceptional Outdoor Environments for almost 30 years! Contact us! Summer Is Here; It’s Time for some Shade!